Post-1850s Romanian history is closely linked to peasant-related issues. Prof. Latham explains why parts of this history, specifically the Peasant Revolt of 1907, have been a ‘no-go’ zone for Romanian historians. He emphasizes, too, the dilemma of chosing between politically and socially motivated land reform versus large-scale agricultural farming demanded of modern economies. 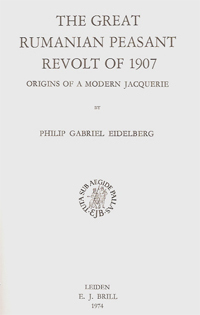 Eidelberg’s book documents the causes of the revolt but stops at describing or analyzing the revolt itself. “It ranks as one of the most important peasant revolts in East European History.” The latter is summarized in the introduction. Click on ‘pages’ to read.